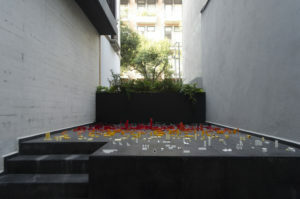 For his solo show with Arróniz Arte Contemporáneo, Javier Barrios has directed his gaze in new directions. 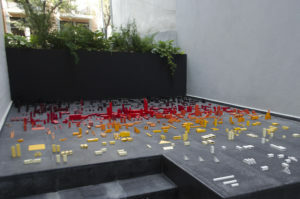 Up until now Barrios has been rather occupied with contemplations on the big questions, especially those related to space and human existence. Now, his point of departure is a more specific one – or at least more tangible and within-reach: cities, combined some peculiar links to topics such as technology, modernism, and not to forget: PCB’s. And as it turns out, these seemingly diverse topics actually turn out be linked in some ways. Considering that the immediate context for this show is one of the world’s most populated places, some interesting associations surfaces, not least in a semantic perspective. Mexico City currently ranks as the world’s 23rd largest city, with close to 20,9 mill inhabitants within its urban area. Although the city barely counts a third of the world’s most populated city (Chongqing, China), ‘metropolis’ might still be a more precise word than ‘city’. 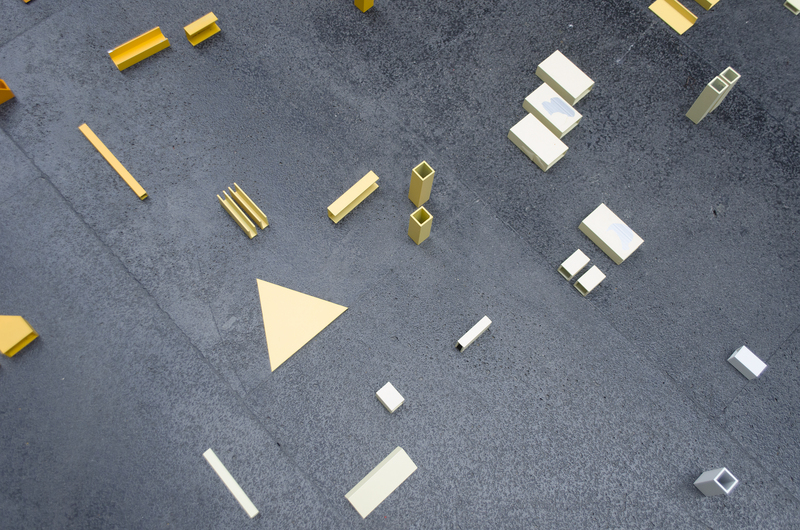 Thoughts on cities and metropolises are most imminent when faced with the main-piece in the show, a sculptural installation sprawling out on a flat surface and taking shape as what comes off as an abstract, geometrical cityscape. 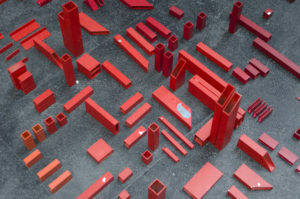 Consisting of dozens upon dozens of aluminum-pieces in different geometrical shapes and various sizes, it instantly seems to be spelling ‘metropolis’. 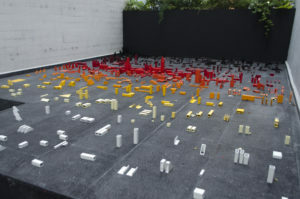 Thus, it may also serve as a visualization of every city in the world and their massive growth – both in terms of inhabitants and also the geographical area occupied – which begun more or less a centennial ago, and which keeps happening. Another intriguing aspect that comes to mind when looking at this installation is PCB. Printed Circuit Boards. Those abstract, rather strange-looking objects which by means of technology program whatever device they are put into. But PCB’s also trigger something else completely: how they may remind one of maps, miniature cityscapes, labyrinthine streets – an abstract microscopic otherworldly city. A tiny world within our world, complex, yet miniscule and thus almost impossible to grasp. This sense of ungrasp ability is not that different from the feeling one may experience when faced with the sheer size of any metropolis. It may also resonate with the complexity in people’s lives today: how they seem to be influenced – polluted almost – by technology, how technology seems to have a hold on next to every little thing, and the possible consequences of its magnitude. Too many actions and apps open at once on the smartphone, too many tabs at the same time in Google Chrome, too many programs running simultaneously – to the brink of collapse, to PCB-crash. Now, this inherent complexity may link to some of the other pieces on view in Barrios’ show. 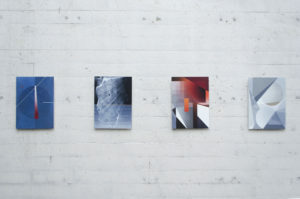 A series of smaller paintings are presented in a grid – not unlike the above-mentioned installation and not unlike how some cities in the world map out. 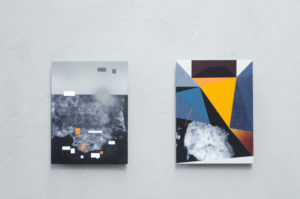 Their material characteristics – oil on aluminum – and the complexity in their geometrical aesthetics provide a certain coolness to them, industrial almost, which also link the paintings to the large-scale installation in both output and the associations they trigger. 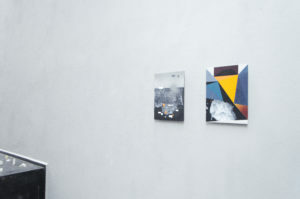 Still, they also open for questions on yet other aspects: Modernity and modernism, these two moments in history that connect to societies’ developing, and furthermore to subjects as widespread as ideas of city planning and new ideas and orientations in visual art. It also follows from this that in the choice of such symbolic materials as oil- paint and aluminum, reflections on the idea of Anthropocene may come to mind. The gist of this idea is that humankind – as a consequence of all our actions, not least caused by the industrialization – has made such an impact on the global environment, that the planet has now entered a new geological era. 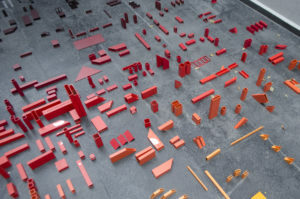 It all comes down to how it all seems to be connected – interlinked as it where – both within this specific assembly of pieces, but also in a larger perspective. Modern age and industrialization and everything that came with it: technology, changes in living-conditions, human kind’s relations to their surroundings, an ever-increasing distancing from nature, environmental issues, the notion of the Anthropocene. You get the picture. 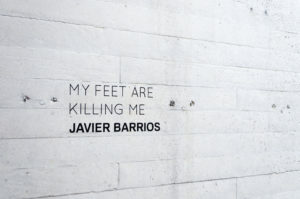 Javier Barrios (b. 1979) lives and works in Oslo, Norway. 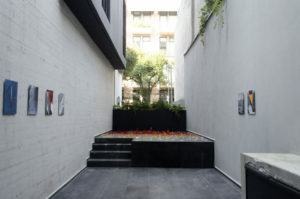 Recent exhibitions include El Olvido Esta Lleno de Memoria at MARSO, Mexico City, and a large-scale wall-painting at the Central Station in Oslo, Norway. 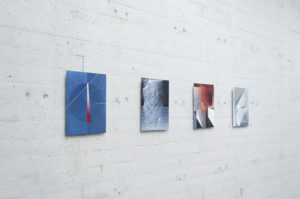 His work has been exhibited in several exhibitions throughout Europe and the US, including Akershus Kunstsenter, Kunstnernes Hus, Trafo Kunsthall, LYNX Gallery, Outlet Gallery, Muskegon Museum of Art, Triumph and Disaster Gallery, Schaufenster Gallery, Rod Bianco Gallery and Galleri K. Barrios attended residencies at ISCP in New York and Galeria MARSO in Mexico City. He is also editor of VECTOR Productions. Barrios received his diploma from The Academy of Fine Art, Oslo and from School of Visual Arts in New York.